With Meghna Chakrabarti. African-American writer Emily Bernard was stabbed by a white man. She tells the story of how it transformed her in the new memoir, "Black is the Body." S4 E01: In this episode, meet memoirist Dani Shapiro, author Soniah Kamal, and professor Emily Bernard. From fearless family memoirs to updating classic fiction to reflect her own culture, each of these authors’ works share deeply personal pieces of themselves. 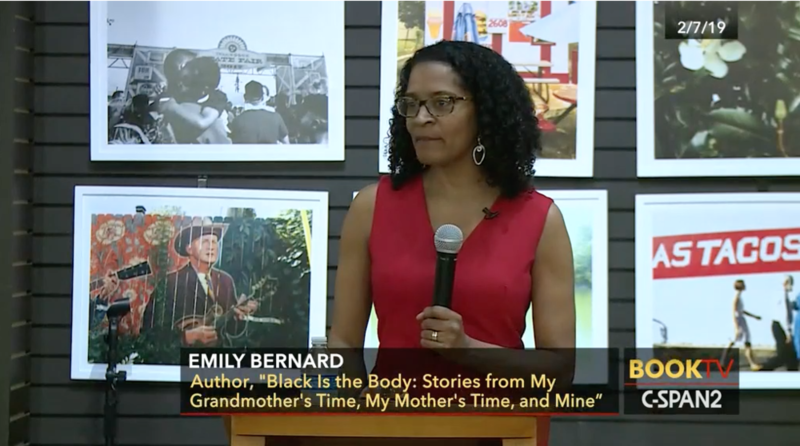 Meet, Greet & Discuss: Black Is The Body - 'Stories from My Grandmother’s Time, My Mother’s Time and Mine' - by author Emily Bernard. Emily Bernard, Professor of English and Ethnic Studies at UVM has written about interracial friendships, the Harlem Renaissance, and most recently, Michelle Obama. Emily Bernard presents a talk entitled '4 Saints In 3 Acts: Gertrude Stein, The Harlem Renaissance & The Politics Of Race And Representation' delivered at The Photographers' Gallery on Wednesday 25 October 2017 on the occasion of the exhibition 4 Saints in 3 Acts: A Snapshot of the American Avant-Garde (20 October 2017 - 11 February 2018). UVM professor Emily Bernard looks at the power and potential of interracial friendships in a talk at Ilsley Public Library in Middlebury on November 2, 2011. Her talk, "Some of My Best Friends: The Power of Interracial Friendship," is part of the Vermont Humanities Council's First Wednesdays lecture series. Emily Bernard teaches in the English department at the University of Vermont. On today’s program, we discuss Emily’s essay “Interstates,” a story about identity, race, and belonging. UVM professor Emily Bernard looks at the transformation of beloved poet and activist Maya Angelou in a talk at Brooks Memorial Library in Brattleboro on January 7, 2015 entitled “Delicious to the Ear: The Inspiring Voice of Maya Angelou,” part of the Vermont Humanities Council’s First Wednesdays lecture series. Before she became an internationally revered poet, memoirist, and activist, Maya Angelou was mute for five years as a child. Bernard will explain how poetry awakened Angelou’s voice, a voice that transformed a history of trauma into inspiration and beauty.